BIAFRANS GATHERED TO REMEMBER HER FALLEN HEROES :WENT HOME WITH MORE FALLEN HEROES. My heart bleeds as I write this, Biafrans reminded the wicked world about her fallen heroes anniversary on the month of May 30th, 2016. We had told the world to checkmate Buhari and his killers to steer clear of the arena Biafrans were to gather for the great event, and as well reminding the world to beam their satellites on Biafra land to watch jihadist Buhari unleash fresh mayhem to the innocent people of Biafra. After all these warnings, Buhari still went on with his attacks, and it was disastrous this time as many lives were wasted. On the early hour of 2am, to the great ceremony of Biafra fallen heros, the Nigerian Boko Haram jihadist with Army uniform invaded St. Edmonds Catholic Church, Onitsha, Anambra State, where Biafrans slept and murdered scores, leaving many injured under the command of Buhari. 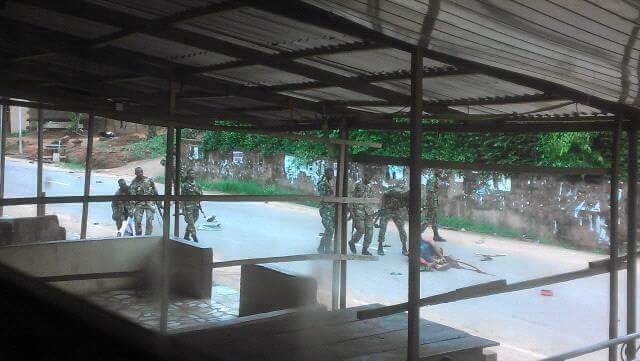 I am asking, is this the democracy Buhari swore to uphold, by killing innocent Biafrans sleeping? Is this fair? Is that humane? I am asking the wicked world who often kept mute allowing this level of havoc meted on only one people, the Indigenous People of Biafra. The remembrance of Biafra fallen heroes turned bloody as the combined Nigerian force men shot at sight without allowing Biafrans to gather and perform the ceremony of the day. The Buhari's killers blocked all the roads of that vicinity, terrorizing, teargassing, maiming and killing every living soul they came across, and I am asking "Why?". What is the tangible reasons or offence for killing Biafrans on her heros day - May 30th, 2016. It was gathered that Hitler, the chief negotiator of Boko Haram, Buhari of Nigeria, relocated all the condemned Boko Haram terrorist recently to Biafra land to kill Biafrans during the heroes remembrance. These terrorists Buhari brought to Biafra land under the guise of Nigeria Army has no badge neither do they have names, the only language those terrorist understand is 'KILL'. More than 50 (50) Biafrans lost their lives on May 30th, while over 300 were seriously wounded, while uncountable numbers were arrested and still missing as we still do not know there whereabout. Still on that, this cruel country named Nigeria and her doctors are demanding for police report before commencing treatment to the injured Biafrans. Very sad. The Nigerian Army after killing Biafrans, took away their kidneys and dumped/buried their remains in the barracks, while they threw some into the River Niger. What more evidence do the world need from Biafrans to separate them from this blood-sucking beast, Nigeria? Haven't Biafrans suffered enough in one Nigeria? Haven't Biafrans been subjected to all manner of dehumanization, servitude, maltreatment and assault enough in Nigeria? Haven't Biafrans cried enough begging for your rescue and support? Haven't Biafrans been killed enough? Has Nnamdi Kanu not suffered enough in detention for him to be released? Have Biafrans not protested enough peacefully on the streets asking for her independence? "What more do the wicked world want from poor maltreated and needy Indigenous People of Biafra to set her free? Can the wicked world take a look at what transpired on the 30th of May, how innocent Biafrans were murdered in cold blood for no offence, and give one good reason why they still want Biafrans to remain and merged with uncircumcised Nigerian idiots? Do the world want Nigerian government led by terrorist Buhari to wipe Biafrans off while they are watching with keen interest? Now I know that the world is truly wicked. It's obvious that Biafrans are alone in this fight for self determination, hence we must triumph. Biafrans survived in the 1967-1970 civil war and will still survive this time come rain, come shine.